You are looking for a charming B&B for your vacation in the Loire Valley? Then, we have just what you are looking for. Le Clos de la Garde is a charming small boutique Bed and Breakfast (Chambre d’hôtes), centrally located in the very heart of the Loire Valley, close to the medieval town of Chinon. The property consists of a group of ancient buildings dating back to the 18th century and this history can still be felt today. Suite Eleonore and Suite Diane consist both of a separate living room and bedroom and are located in the annex. The recently renovated room room deluxe “Anne” is in the main building and has individual access. A delicious French breakfast is included and we also offer you a homecooked 3-course dinner (Table d’hôtes) on request. All rooms comprise of a modern en-suite bathroom and the large and comfortable king size beds invite you to relax after an eventful day. Le Clos de la Garde is a delightful guesthouse with traditional accommodation with all modern comforts. Children and Dogs are welcome and with the appeal of French country life it is predestined to be an eventful vacation. Further amenities include free WIFI (WLAN) and free private parking. Fairytale Castles, such as Chenonceau, Rivau, Azay, Ussé and Langeais are lined up along the Loire like pearls on a chain and are all within the vicinity, as also are the splendid gardens of Villandry and Valmer. Medieval villages, museums and lively towns such as Montsoreau, Richelieu, Tours, Angers or Le Mans are fascinating to any visitor interested in culture. Relish the untouched nature whilst on a walking or bicycle tour – or, for the daring, during a flight in a hot air balloon. The region is ideal for a vacation with children. Apart from zoos and adventure parks you will find many possibilities to entertain little guests. Or just sip a glass of wine – hundreds of winemakers in the area invite you to a winetasting in their cellars. Your English speaking host Manfred Fritsch will be delighted to welcome you and make your vacation in France an unforgettable one. All our visitors admire the little “monastery garden”. It’s herb produce is used in the kitchen, but also for herbal teas for breakfast. Le Clos de la Garde – This most delightful Guesthouse (B&B) with typical French Flair is located in the Loire Valley and is close to Chinon. 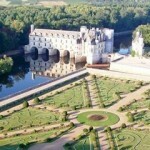 You are looking for accommodation which is full of charm for your vacation in the Loire Valley? Then, we have just what you are looking for. Le Clos de la Garde consists of a group of ancient buildings dating back to the 18th century. There is plenty of history, its presence can still be felt today. In one annex you will find two cosy and individually furnished Suites which are available on a Chambre d’Hotes basis (Bed and Breakfast) or on Table d’Hotes basis (demi pension) which includes dinner consisting of several delicious courses. The newly converted Double Room Deluxe in the main building has it’s own private entrance. All rooms comprise of a modern bathroom and the large comfortable beds invite you to relax after an eventful day. “Live the Life of Riley” during your holiday in France in traditional accommodation with all modern comforts. Children and dogs are welcome and with the appeal of French country life it is predestined to be an eventful vacation. Further amenities include free WLAN (WIFI), free parking, and your dog will love the 3000 square metre spacious walled garden. Fairytale Castles such as Chenonceau, Rivau, Azay, Ussé and Langeais are lined up along the Loire like pearls on a chain and are all within the vicinity, as also are the splendid gardens of Villandry and Valmer. Medieval villages, museums and lively towns such as Montsoreau, Richelieu, Tours, Angers or Le Mans are fascinating to any visitor interested in culture. Relish the untouched nature whilst on a walking or bicycle tour – or, for the daring, during a flight in a hot air balloon. The region is ideal for a vacation with children. Apart from zoos and adventure parks you will find many possibilities to entertain little guests. Experience it for yourself. Your English speaking host will be delighted to welcome you.